Top Analysis of BBC: Why Asian Children Wear Glasses Mostly? 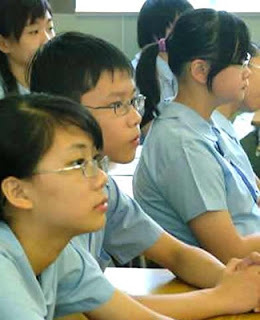 Up to 90% of school leavers in major Asian cities are suffering from myopia - short-sightedness - a study suggests. Researchers say the "extraordinary rise" in the problem is being caused by students working very hard in school and missing out on outdoor light. The scientists told the Lancet that up to one in five of these students could experience severe visual impairment and even blindness. In the UK, the average level of myopia is between 20% and 30%. According to Professor Ian Morgan, who led this study and is from the Australian National University, 20-30% was once the average among people in South East Asia as well. "What we've done is written a review of all the evidence which suggests that something extraordinary has happened in east Asia in the last two generations," he told BBC News. "They've gone from something like 20% myopia in the population to well over 80%, heading for 90% in young adults, and as they get adult it will just spread through the population. It certainly poses a major health problem." Eye experts say that you are myopic if your vision is blurred beyond 2m (6.6ft). It is often caused by an elongation of the eyeball that happens when people are young. According to the research, the problem is being caused by a combination of factors - a commitment to education and lack of outdoor light. "We're talking about the need for two to three hours a day of outdoor light - it doesn't have to be massively sunny, we think the operating range is 10-20,000 lux, we're not sure about that - but that's perfectly achievable on a cloudy day in the UK." Cultural factors also seem to play a part. Across many parts of South East Asia, children often have a lunchtime nap. According to Professor Morgan they are missing out on prime light to prevent myopia. "Children suffer from a double whammy in South East Asia," says Professor Morgan. "As a result of massive educational pressures and the construction of a child's day, the amount of time they spend outside in bright light is minimised." A big concern is the numbers of students suffering from "high" myopia. According to Professor Morgan, this affects between 10% and 20% of students in Asian cities. It can lead to vision loss, visual impairment and even blindness. "These people are at considerable risk - sometimes people are not told about it and are just given more powerful glasses - they need to be warned about the risk and given some self-testing measures so they can get to an ophthalmologist and get some help." For decades, researchers believed there was a strong genetic component to the condition. It was believed that people from China, Japan, Korea and other countries were particularly susceptible to developing myopia. But this study strongly suggests an alternative view. In Singapore, where there are large numbers of people from Chinese, Malay and Indian backgrounds, all three ethnic groups have seen a dramatic rise in short-sightedness. Professor Morgan says you cannot rule out genetics completely, but for him it's not the major factor. "Any type of simple genetic explanation just doesn't fit with that speed of change; gene pools just don't change in two generations. Whether it's a purely environmental effect or an environmental effect playing a sensitive genome, it really doesn't matter, the thing that's changed is not the gene pool - it's the environment."